Chestnut Oak (Quercus prinus), a tree native to the eastern US, usually grows on dry slopes. Oaks (Quercus spp) are members of the beech (Fagaceae) family, which also includes American Beech (Fagus grandifolia). 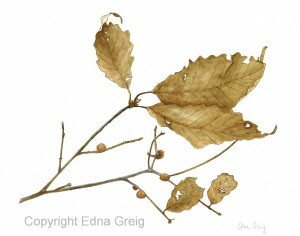 Young trees of the beech family often hold onto their dried leaves in winter, making them interesting botanical art subjects. For this drawing, I selected a Chestnut Oak branch with several round stem galls. Galls are swellings that form when insects such as wasps or midges lay eggs in the plant tissue. Galls are common on oaks. Historically, an ink was made from oak galls, so I thought it was appropriate to include galls in my ink drawing.